A pretty #hosta plant in my #garden. Here’s a winning pick that will add flair to your yard’s shady spaces. Hosta is a gardener’s dream plant because it requires minimal attention, looks fantastic, and returns faithfully each spring. A few years ago, I purchased a few hosta gems at a local greenhouse, dug holes, added small heaps of fertile soil, plunked the plants in the holes, crossed my fingers, and occasionally sprayed the area with a blast of water from the garden hose. They lived! Not only did the plants thrive, they added character to the yard with their attractive broad leaves in contrasting shades of green and gold. The best part? Each year my investment grows as the clumps get bigger. Hostas are mound shaped perennial plants native to Japan, Korea, and China, so they have a tropical, exotic appeal. In the late 1700s, hostas were imported to Europe; they later reached the United States of America in the 1800s. In old gardening books, hosta may be referred to as funkia or day lily, terms no longer in vogue. The term plantain lily is still in use today in some gardening circles. Hosta is a top-selling plant in North America. Garden centres carry many hosta varieties as there are hundreds of species and hybrids of these members of the lily family. There are hostas with waxy leaves that appear blue, and even ones with fragrant flowers called Hosta plantaginea. Clump sizes range from minis, starting at around ten centimetres wide, to giants, around two metres wide, and every size in between. The plants have different shapes and textures of leaves; also, they can have lavender or white blooms on upright stalks that debut at varying times, such as July and August. 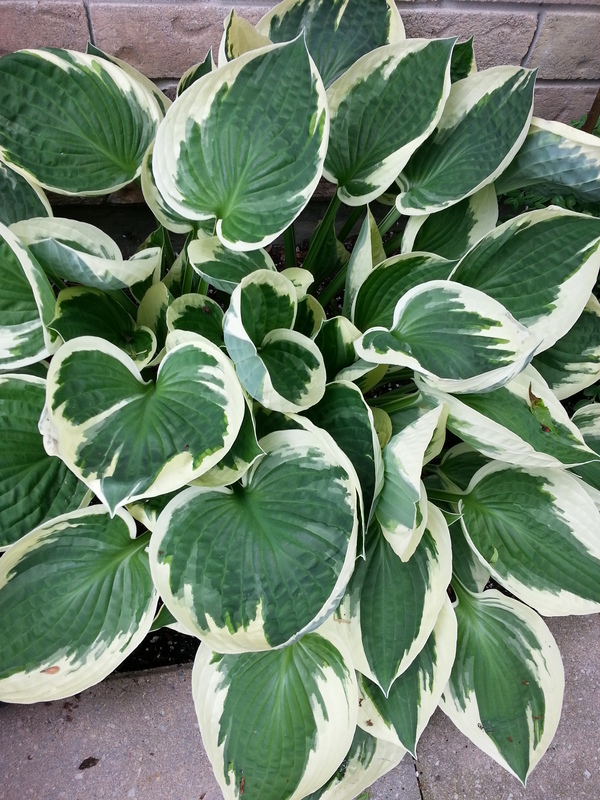 New owners of hosta plants should know that most plants do well with some morning or filtered sun. Adding compost, or a good rotted manure and top soil mix, are options to improve poor soil conditions. Beware! Slugs can be a problem, and deer may devour the plants. This year, why not add pizazz to your yard at home or at the lake by sowing hosta? You can even cultivate good relations by dividing a well-established plant in the early spring and sharing it with a neighbour. Our hostas are under snow now 😦 so it’s time to bring on the fresh smelling pine until Spring!